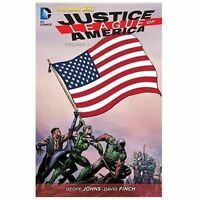 As the smoke clears from the Trinity War , one thing looksdisturbingly clear - the members of the Justice League of America aredead, betrayed by one of their own! But as with the Trinity War, all is not whatit seems. Martian Manhunter and Star Girl have lived to fight another day andfind themselves trapped on an alien world that is under the control of a groupof super-villains. The key to their survival may lie in the hands of thesuper-villain Despero, but will these heroes be able to find it withinthemselves to trust soemone who is supposed to be their mortal enemy? Collects Justice League of America #8-14.